The Burmese is a domestic breed of cat who originated in Burma (now Myanmar) and was developed in the United States and Uthe nited Kingdom. Their laid-back personality, and ability to get along with children and other pets makes them one of the most popular cat breeds in the world. The only thing better than a Burmese cat is two Burmese cats. Named after their country of origin Burma, the exact origins of the Burmese are shrouded in mystery. There is mention of a copper-coloured cat in the ancient Thai Cat Book which was written during the Ayudhya Period, stretching from 1350 – 1767. 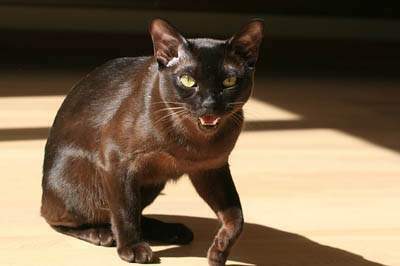 In 1930 Dr Joseph Thompson imported a small brown (sable) coloured female cat by the name of Wong Mau to San Francisco. Wong Mau was to go on to be the founding cat of the Burmese breed as we know it. A breeding programme was established in an attempt to produce offspring which bred true. Dr Thompson enlisted the help of Virginia Cobb (Newton cattery), Billie Gerst (Gerstdale cattery), and Dr Clyde E. Keeler. 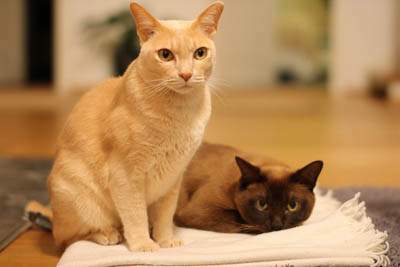 Wong Mau was bred to a seal point Siamese called Tai Mau in 1932 and the resulting litter consisted of two colours, some just like Siamese kittens and brown kittens with darker points (like Wong Mau). Wong Mau was mated to a son from this litter (Yen Yen Mau) and this litter contained three colours, again, some like Siamese kittens, brown kittens (again like Wong Mau), and dark brown kittens. 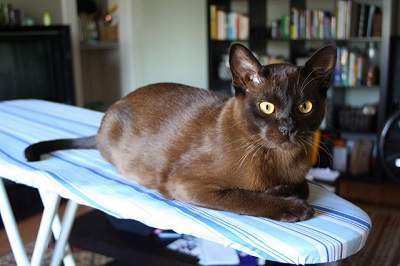 The dark brown offspring did indeed breed true and became the foundation cats of the Burmese breed. 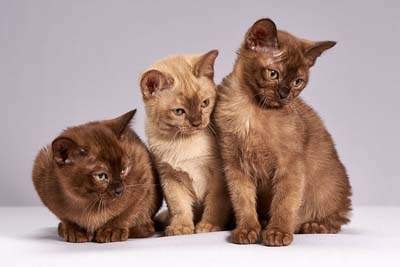 Wong Mau continued to produce kittens with three colour variations and it is now accepted that Wong Mau was, in fact, a Siamese x Burmese hybrid. 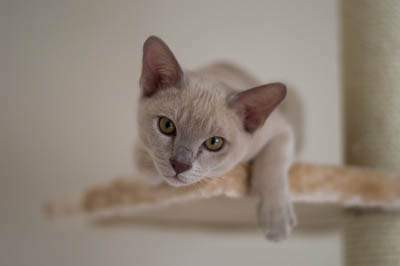 The Burmese was accepted for registration by the Cat Fanciers Association in 1936 although the breed was suspended in 1947 due to breeders mating Burmese with Siamese. The CFA stated that the breed must be three generations of pure Burmese which was achieved by 1956 and the breed was once again accepted for registration in 1957. All Burmese cats should be able to be traced back to Wong Mau. Dr. Thompson authored an article on Burmese genetics in 1943 which can be read here. The largest litter of kittens was delivered by a Burmese cat on August 7, 1970. Tarawood Antigone, a four year old brown Burmese, owned by Valerie Gane of Oxfordshire, UK, gave birth to nineteen kittens. The surviving fifteen kittens consisted of one female and fourteen males. There are now two types of Burmese, the European Burmese, and the American Burmese. While they share many common traits, the American Burmese has a rounder face compared to the European Burmese. Burmese are often described as a ‘brick wrapped in silk’ which is very accurate, they feel surprisingly heavy when picked up. The body is medium in size, well-muscled, strong and athletic. They are compact but solid, without being chunky. Males can weigh between 5-6 kg (11-13 oz) and females 4-5 kg (8.8-11 oz). The head is wedge-shaped, with a strong lower jaw and chin, a distinct nose break and medium sized ears which are set well apart. The eyes are a beautiful golden colour, large and widely spaced. Their body is medium in length and well muscled and the chest is strong and round. Legs are slender and the feet are oval in shape and small. The coat is short, silky and close lying with almost no undercoat. 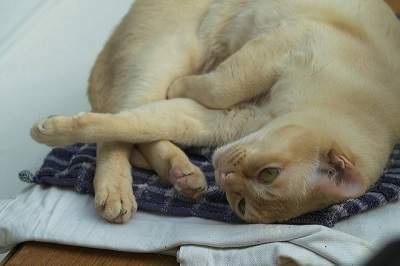 Burmese are a well-balanced cat with no extreme features. Not all cat councils accept all colours, some only recognise the original four colours of brown, chocolate, lilac and blue. 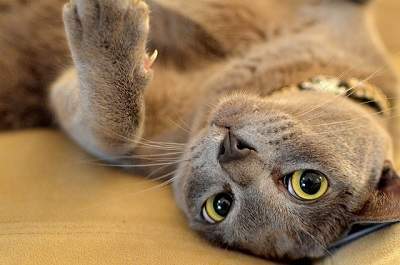 Burmese cats are laid back, social, intelligent, gentle and sweet cats who are less vocal than their Siamese cousins. Burmese are playful cats, especially when they are younger but they are not constantly on the go like some other active breeds. Once they have worn themselves out, they love nothing more than sleeping on their human companion’s lap. With a dog-like personality, they will follow you around the house all day long, hoping to get a pat or stroke and get along with everyone, including children and other pets. 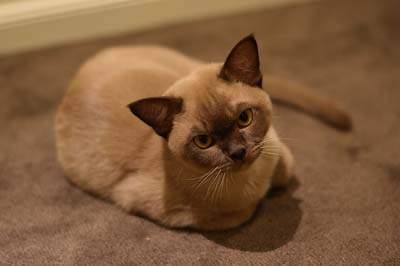 Male Burmese cats are very affectionate, females are too, but a little more independent. Their curious nature can sometimes border on intrusive when they insist on checking out the contents of a visitors handbag or toolkit. But that shouldn’t pose too much of a problem as they are able to work their charm even on non-cat-lovers. 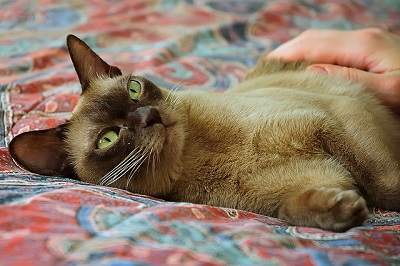 Burmese cats are an exceptional family pet. They thrive on company and don’t like to be alone for extended periods of time. If you are out of the house for long periods consider two cats. Always choose a registered breeder when purchasing purebred cats. Check to see which cat council they are with Where possible, visit the breeder’s premises to meet the cat as well as his parents (if possible). The premises should be clean and the cats all healthy. 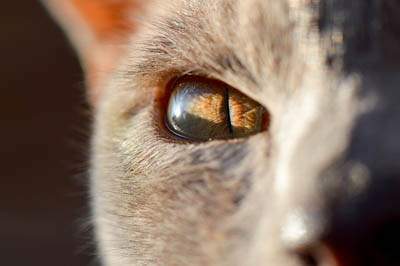 Be wary of cats with eye or nasal discharge. Cats should be friendly. I like to buy kittens who have been raised under-foot, which means they are raised in the home with the family. 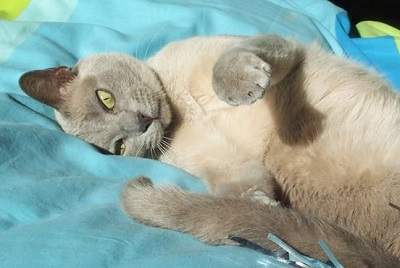 If you are looking for an older Burmese, breeders sometimes rehome former breeding cats. You may also check to see if there is a Burmese rescue group in your area. Kittens should not leave the breeder until they are at least 12 weeks of age and have had their first two vaccinations as well as regular worming and flea treatment. Many breeders also prefer to desex (spay/neuter) kittens before they go to their new home. This list may look long but a lot of these conditions are rare even in Burmese. It is possible to prevent some (gum disease), and pick up others early, so that they can be managed. I have had three Burmese, two lived into their mid-teens and died of age-related conditions, the third was sadly killed in an accident. When speaking to breeders, it is always important to ask about these conditions and if their cats have been tested for ones which can be tested for. Responsible breeders recognise this and they will take steps to test, and if necessary remove breeding cats from the pool if they are at risk of passing on inherited conditions. Burmese cats are low maintenance. Brush the coat once a week to remove loose hairs. Indoor cats may need to have their claws trimmed every few weeks. Feed a premium quality food and provide raw chicken necks or human grade steak 2-3 times a week for dental health. Annual health checks are a must and increase to once your Burmese reaches seven. Desex by six months of age to prevent unwanted litters. Treat regularly for fleas and worms (including heartworm). Keep your Burmese indoors, or give him access to a safe cat enclosure, they are too trusting to roam outside. 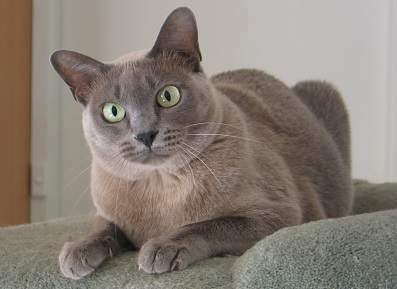 Everyone, Burmese cats are very friendly and people oriented. They thrive in the company of others and make an ideal family pet. If I had to recommend one breed, it would be the Burmese. Hello! 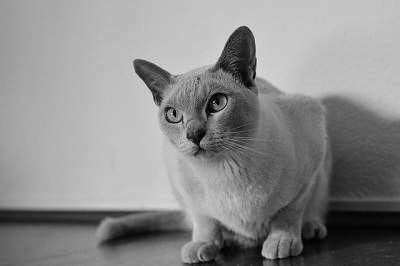 We find our burmese cat Zefir (he’s from Latvia, photo by Ivars Pinkulis) – plz wright his name under the photo :)))) (First photo after Colours)…. Sorry do you mean the sable Burmese who is walking and talking?